On August 19th we went on a train excursion via the Cuyahoga Valley Scenic Railroad. 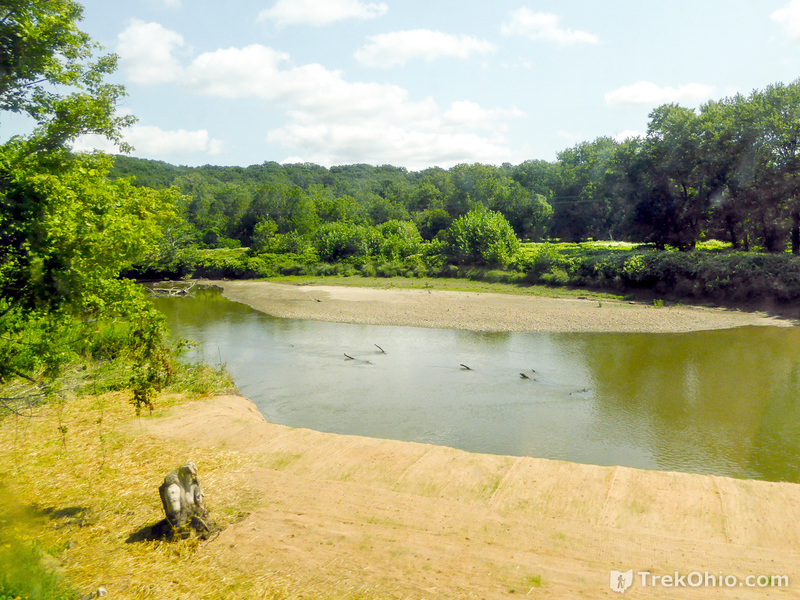 The railroad line runs north-south through the Cuyahoga Valley National Park. The proprietors offer a variety of excursions. 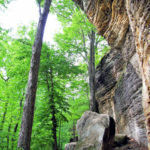 We chose the National Park Scenic Excursion, which is a three-hour, round-trip tour of the park. Since this was a sight-seeing expedition, we splurged and bought tickets for the Premium Upper Dome. In theory our tickets were good for the entire day, and we were allowed to get off at any stop and then re-board the train later. However, in practice when you get off at a depot it will be hours until the train returns to that depot. When you do re-board a train, there may no longer be an open seat in the upper dome. Since these tickets are somewhat more expensive, it seemed like it would be a waste to pay extra for them, but not have access to the upper dome on re-boarding. 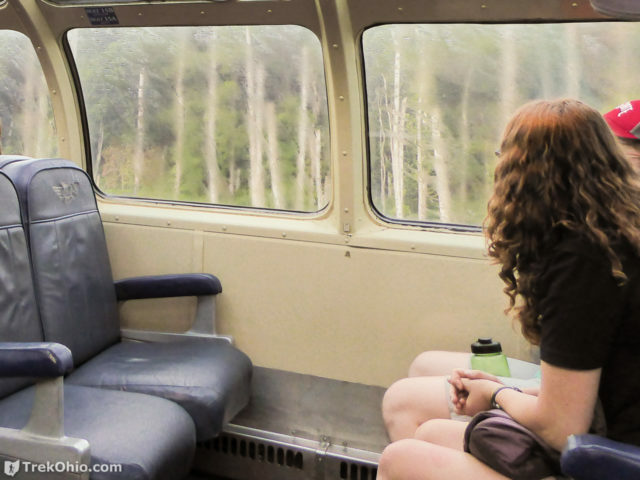 Because Bob and I had already visited many of the park’s most popular regions, we decided to stay on the same train for the entire round-trip. 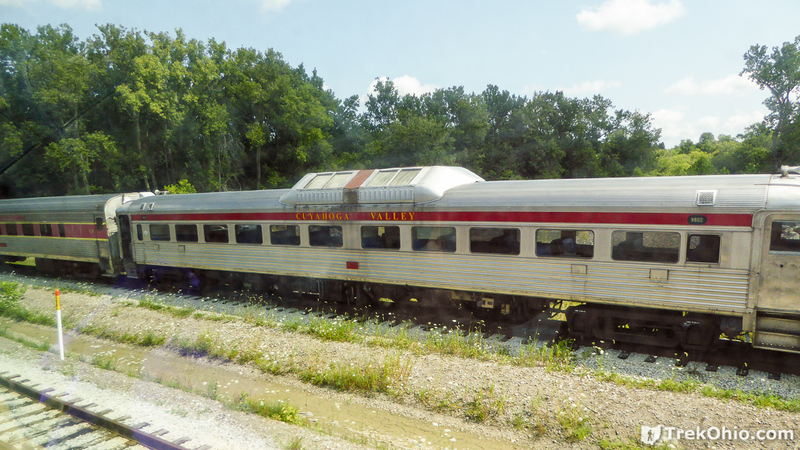 We began our trip at Rockside Station which is at the far northern end of the line (the depot is at 7900 Old Rockside Road, Independence, Ohio). We picked this starting point because it was the earliest run of the day, so the remainder of our day would be unscheduled and we could be a bit more spontaneous in choosing other activities. I reserved our tickets online the evening before our trip. While making the reservations, I discovered that only four seats were still available in the upper dome. I thought this would mean that once we were on board, at most there would be two empty seats left. However, over half the seats were empty. The conductor explained that when people reserved a seat for the train, they could take possession of the seat at any depot on the trip. It turns out that many people didn’t get on until we reached the far southern end of the line at Akron, but many people also got off there, so there were still lots of empty seats. Riding in the upper dome is a bit like riding on the top level of a double decker bus. You climb a staircase to an elevated seating area. From the upper dome, looking down at the seating below. 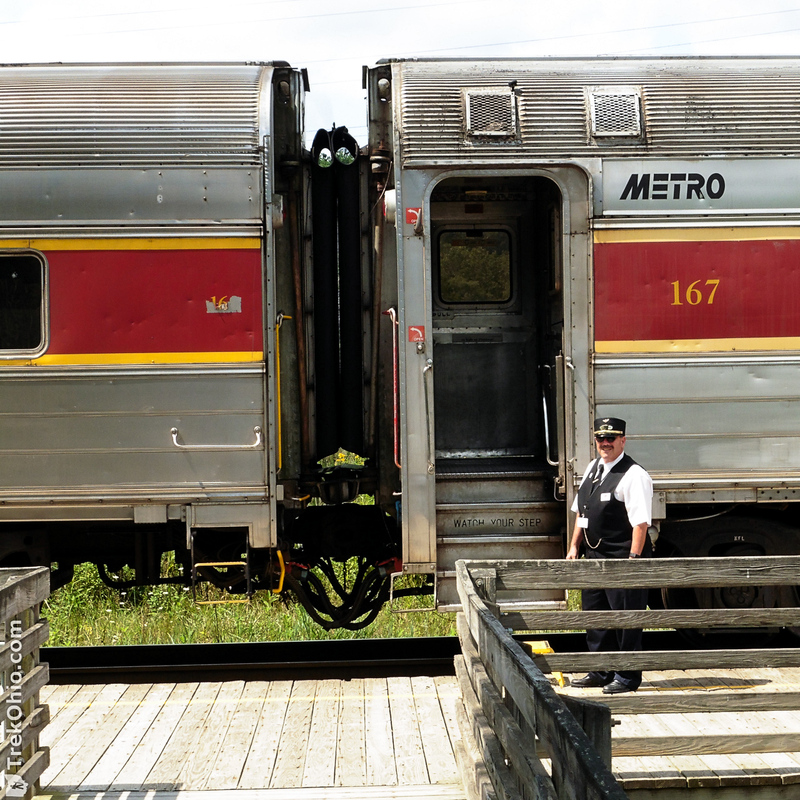 We learned that the park’s railway line has 18 salaried employees and 2000 volunteers. So almost all the staff members that we met were volunteers, including all of the conductors like the ones pictured above and below. 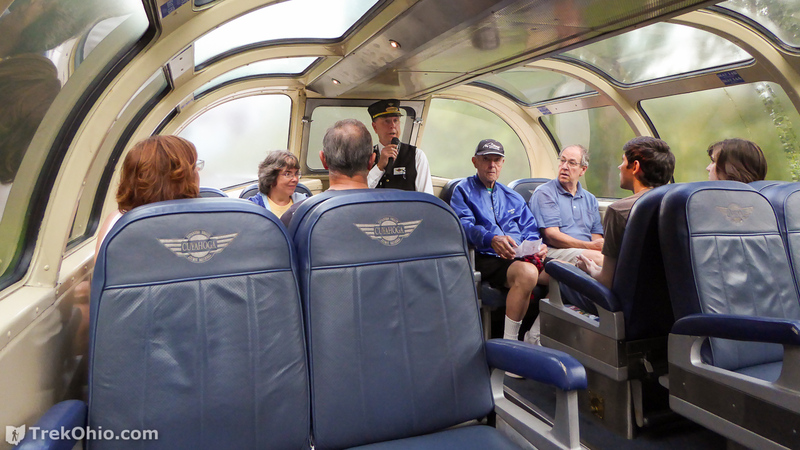 During our outbound trip a conductor using a microphone also acted in the capacity of tour guide; he shared information with us about the train, about Cuyahoga National Park, and about the surrounding communities. On the inbound trip he was replaced with a different volunteer conductor. A different staff person appeared once on the inbound trip and once again on the outbound trip offering complimentary bottled water and snacks (choices included individually wrapped cookies, packages of crackers, Rice Krispies Treats, etc.). I’m not sure if the free treats are available to all passengers, or if they are only offered in the Upper Dome. During the trip passengers also have the option of walking to a different coach that has an onboard store. At the onboard store passengers can buy sandwiches, drinks, snacks, or even souvenirs. If you do purchase food and drink there, you have to carry them back to the coach in which your were traveling to consume them. The train has a dining car, but meals in the dining car are only available to individuals who purchase tickets for specific meals (see information on eating the following meals in the dining car: Breakfast Train Rides, Lunch Train Rides, and Evening Dining Rides). The railway line also offers ticket packages with an adult-beverage theme, such as Ales on Rails and Grape Escape. And I note in passing that restroom facilities are also available. 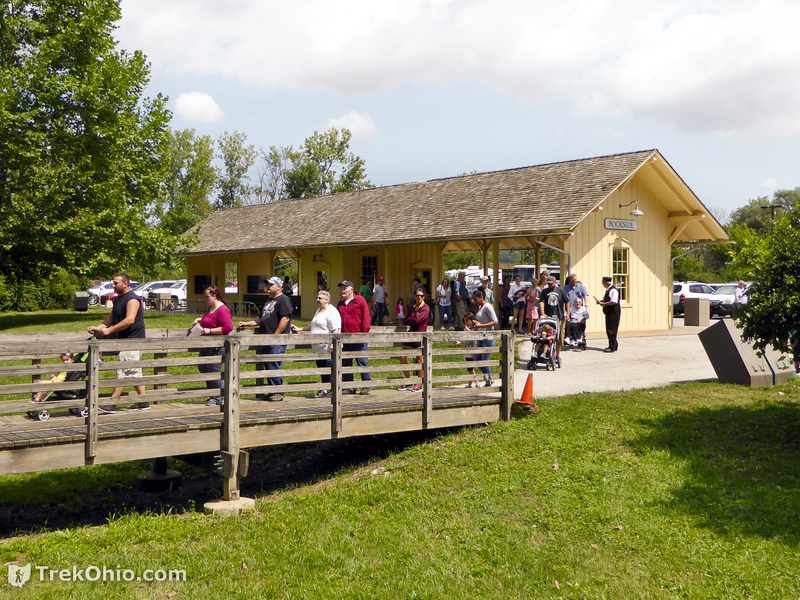 Once during the trip a park official also came by to speak about Ohio’s wildlife. He brought sample furs with him that passengers could touch or examine more closely as he discussed their adaptive features and their economic role in times past. I’m under the impression that he walked through every coach on the train sharing this presentation. 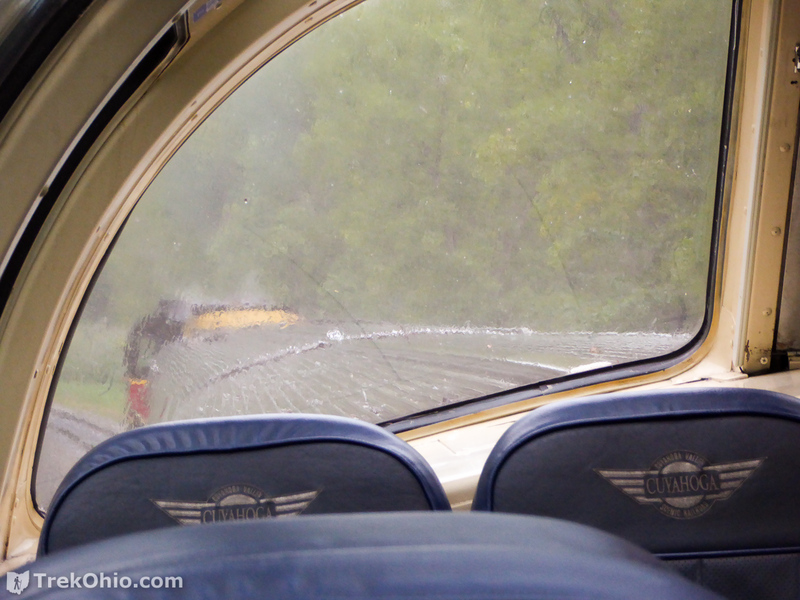 It had just started to rain while we were boarding the train, and it continued to rain for an hour or so. The best feature of the upper dome is its abundance of windows, but the rain did reduce visibility considerably. So I have included a couple photos to show how the rain impacts the view. Fortunately for us, blue skies followed, and on our return trip we were able to clearly see some of the areas that weren’t so visible during the rain. The conductor explained that the train never goes faster than 29 mph. For us taking a slow ride through a scenic area was both relaxing and enjoyable. Below I am going to include photos showing some of the areas that we passed through. 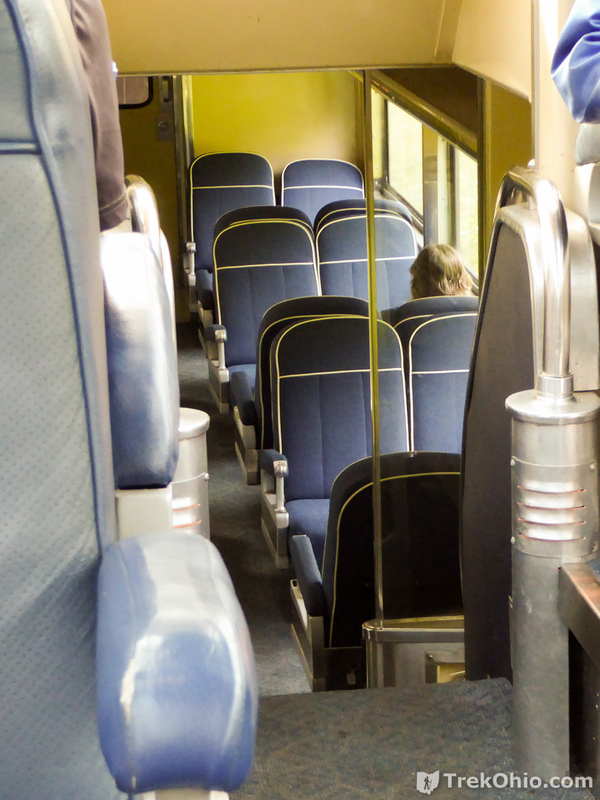 In some cases you can see a portion of train’s window frame, and in others you can’t. But all the photos below were taken through the windows of our coach. 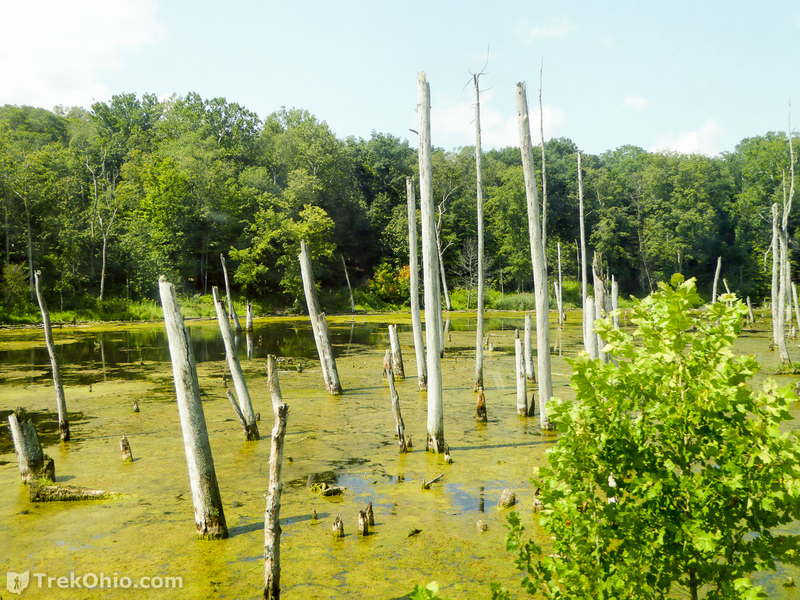 In one of the rainy photos while we were passing through a wetland, you could see tree snags (trees that have died because their roots are now under water). On the way back we got a much better view of this area. Trees that have died because a wetland has overtaken their area. 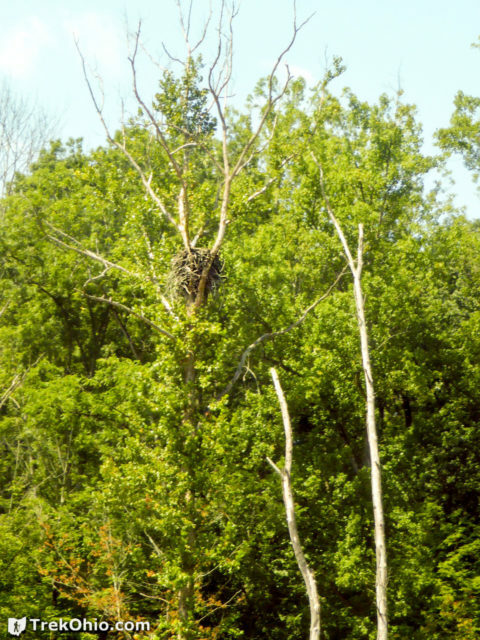 This particular wetland was of interest because there is a bald eagle’s nest in one of the trees. Since we were there in August, the young eagles had already fledged, so there’s no reason for the eagles to hang around the nest. However, if you were to go on this trip earlier in the year, there’s some chance you would see one of the parents near the nest. There is an eagle’s nest in the tree to the left. 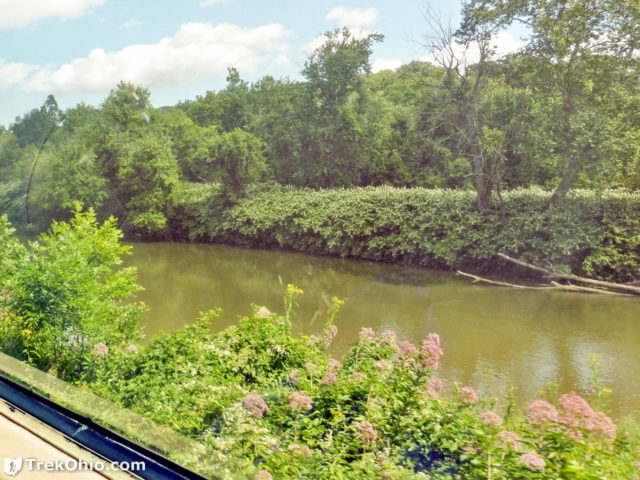 The Cuyahoga River flows through the Cuyahoga Valley National Park, and we had many views of the river during our train ride. The flowers growing on the near-side of the river are Joe Pye Weed, a butterfly favorite. 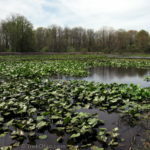 We previously posted an article describing our visit to Beaver Marsh. The tow path trail passes through the area, and there is a boardwalk that crosses over the marsh. 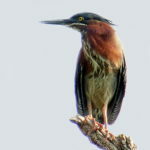 This is a fantastic area to do some bird watching, even if like us you’re rank novices. After the train ride we went on a short hike in the area, and while there we saw great blue herons, green herons, wood ducks and a least bittern. I definitely wouldn’t have spotted the last one were it not for friendly, more-experienced birders pointing it out to me. In addition, the area contains the remains of a couple of old locks that were once part of the Erie Canal. 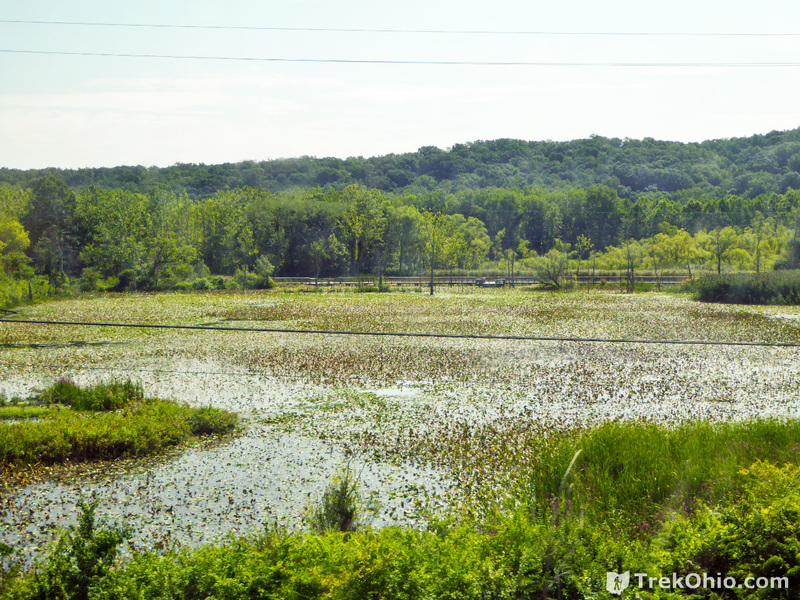 Below is a view of Beaver Marsh from the train. The conductor explained to us that this region was once relatively dry, and contained a garbage dump which included dozens of old, wrecked vehicles. As volunteers labored away clearing the dump, the plan was to turn the area into a parking lot for the park. However, in the meantime beavers moved in and built a dam which created the marsh that you see today. If I recall correctly the park official said that there are now over one hundred beavers in the park, and since there is no trapping in the park and not much in the way of predators, we can expect many more in the future. In the topmost photo in this article, you can see that there is a wall of trees on each side of the tracks, and there were definitely areas where that was all you could see. But there were also times when we passed through open areas. Sometimes these open areas were grassy fields, other times they looked a bit more marshy and wild, and at times they were even crop fields. 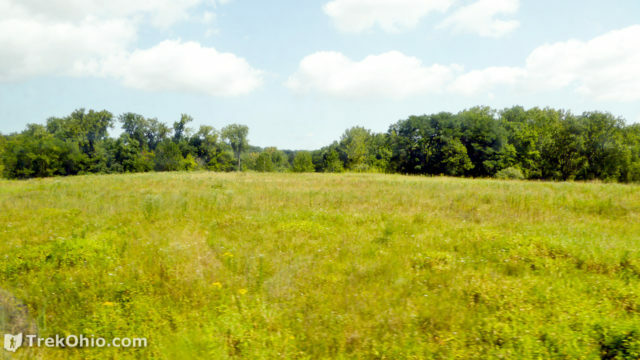 The conductor explained that much of this land was once farmland, and that the park has a policy of maintaining a portion of this farmland as a memorial to the agricultural history of the area. In fact there is a working, historic farm within the park that is open to visitors: Hale Farm and Village. Approximately 33,000 acres of land are enclosed within the boundaries of Cuyahoga Valley National Park. 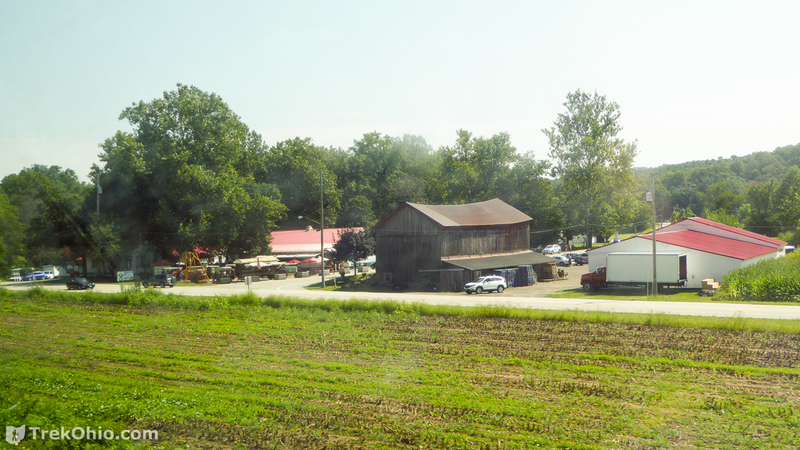 However, prior to becoming a park, there were many farms and homes in the area, even businesses and towns. To create the park, a considerable amount of private property was purchased, and many buildings were demolished, so the area could revert back to a more natural state. However, to this day there are a considerable number of inholdings within the park boundaries. An inholding is property that remains in private hands within the boundaries of a public park. Cuyahoga Valley National Park contains many acres of inholdings, including entire towns, like the town of Peninsula. Once you subtract the inholdings from that 33,000 acres of land, it turns out the park is closer to being 19,000 acres in size. The train passes through this village within the park. 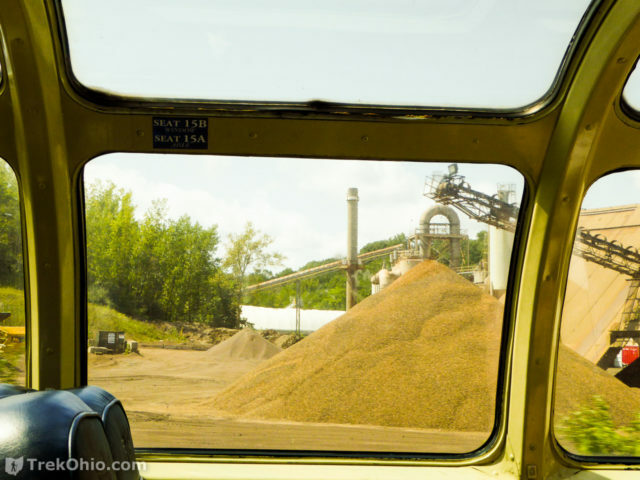 An inholding where a business processes sand, gravel, etc. These inholdings also provide some advantages to park visitors. For instance, when you visit a national park out west, you will more than likely have to pay an admittance fee. 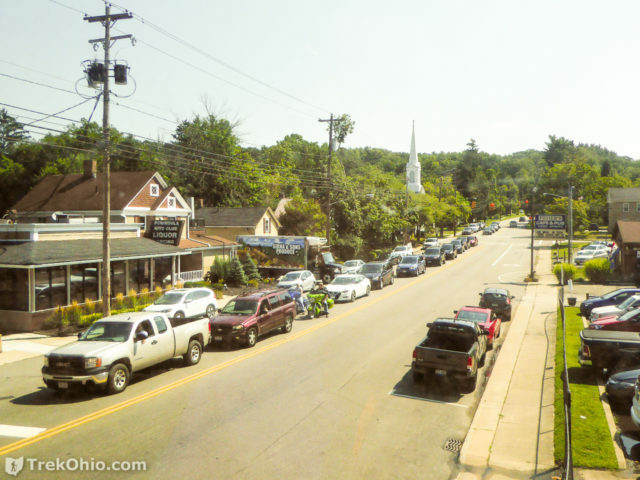 Since people still live and work within Cuyahoga Valley National Park, there is no real way park officials can assess an entrance fee. So while many people plan their visits to other parks to take advangage of Free Entrance Days in the National Parks, every day is a free entrance day at Cuyahoga Valley National Park. In addition there are many businesses in the park who cater to tourists. 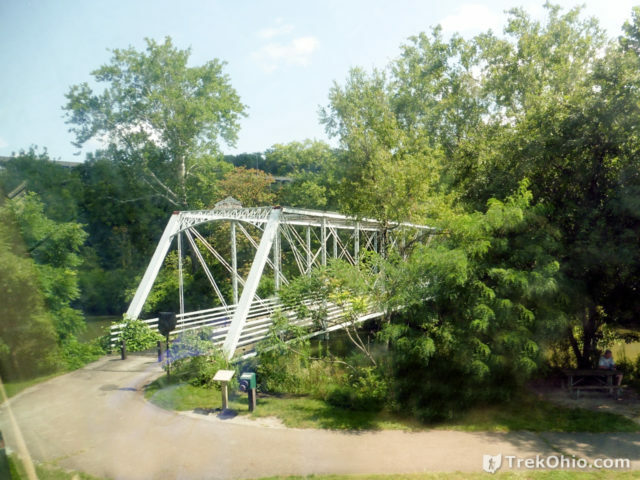 For instance, if you want to try cycling on the park’s tow path trail, but don’t want the hassle of strapping all your family member’s bikes to the car, you can find a business within the park that rents bikes. The tow path trail within the park is extremely popular with cyclists. The path is flat, the area is scenic, and you are traveling on a multi-purpose path away from traffic. For those of us who only cycle once in a while, it can be hard to gauge when you should turn around and head back to your starting point. After all, you don’t want to be overly tired and achy when your pleasure ride is over. However, the Bike Aboard! program takes all the guess work out of knowing when you’ve traveled as far as you should. Basically you can go till you feel like you’ve had enough fun cycling, then flag down the train to take you back to your starting point. The railway only charges $3 per cyclist to transport you and your bike back to the beginning. The biggest catch, however, is that trains don’t go by that often. On weekends, the train only makes three round trips per day, and on weekdays (Tuesdays through Thursday), it only makes two round trips. So you might still have to do some planning to take advantage of the program to avoid a long wait for the train. This friendly youngster is merely greeting us with a wave. If you want the train to stop so you can get on board, you have to wave both hands over your head. Similarly tired hikers or runners can flag the train down and travel back for $3. As if that weren’t enough, the train also caters to kayakers. Kayakers can flag the train down to take them and and theirs kayak back upstream to where they parked. It is just $9 for a one-seater kayak, and $12 for a two-seater kayak. A rail yard is a place to store railroad cars and engines, and sometimes it is also where the maintenance work is done (though this is specifically called a maintenance yard). Our conductor explained that almost all of this work is also done by volunteers. Since there are no factories producing replacement parts for the scenic railroad’s vintage coaches and locomotives, parts sometimes have to be custom machined. While we were on our tour, we passed one of the individuals who machined these parts (in his day job he works as a motorcycle repairman). 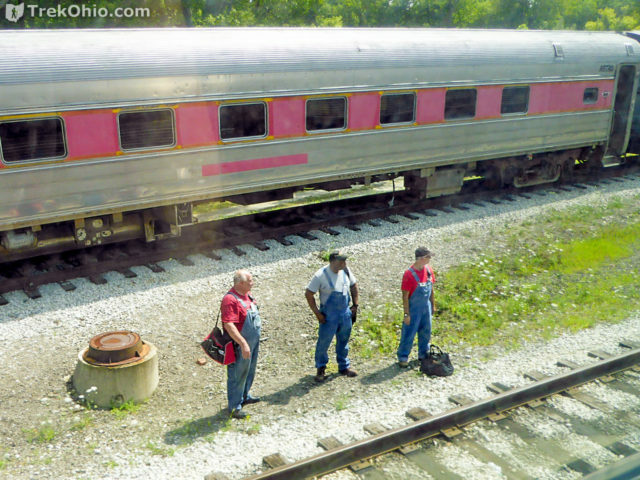 Unfortunately, I was unable to get his photo, but below you can see a bit of the rail yard and some volunteer engineers who were working in the yard. The rail yard was fairly large; this is just a tiny part of it. When water drains into two different river systems due to an elevated region, this is called a watershed divide. 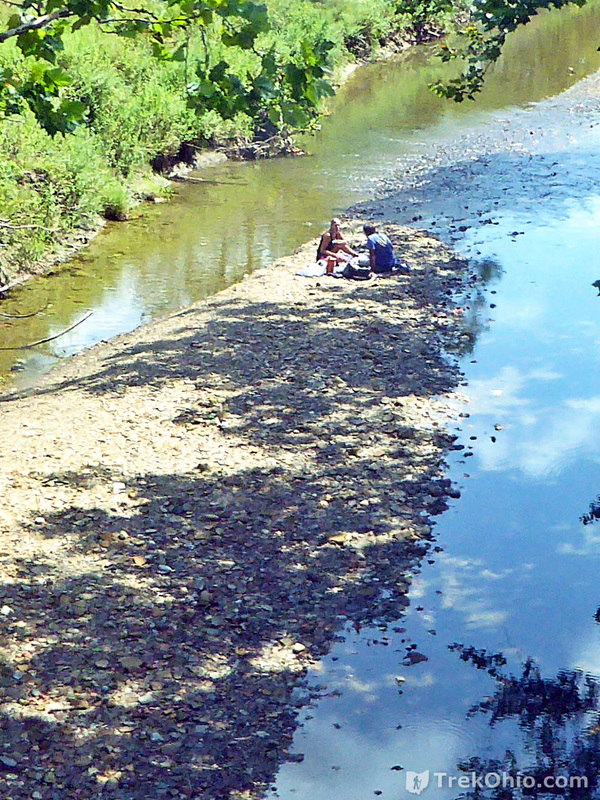 And near Akron there is a watershed divide between the Cuyahoga and the Tuscawaras river systems. If you were trying to navigate from northern Ohio to southern Ohio via boat, you would have to transport your boat over dry land across the watershed divide until you reached the next river system. This is exactly what the Native Americans did when they were traveling in what’s now Ohio. 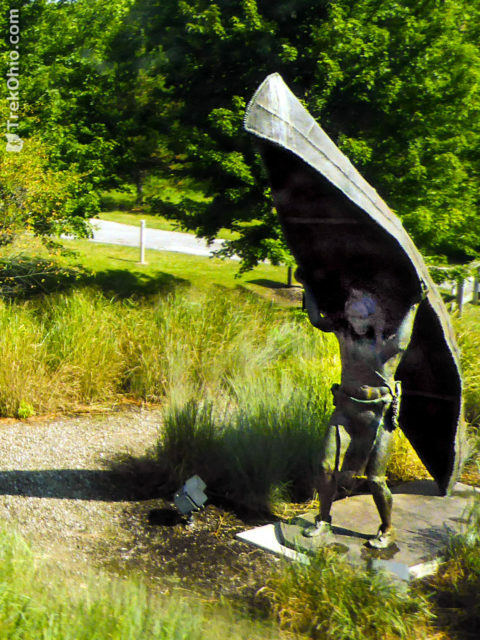 In commemoration of this there is a statue of a Native American carrying his canoe over the watershed divide that the train passes in Akron. 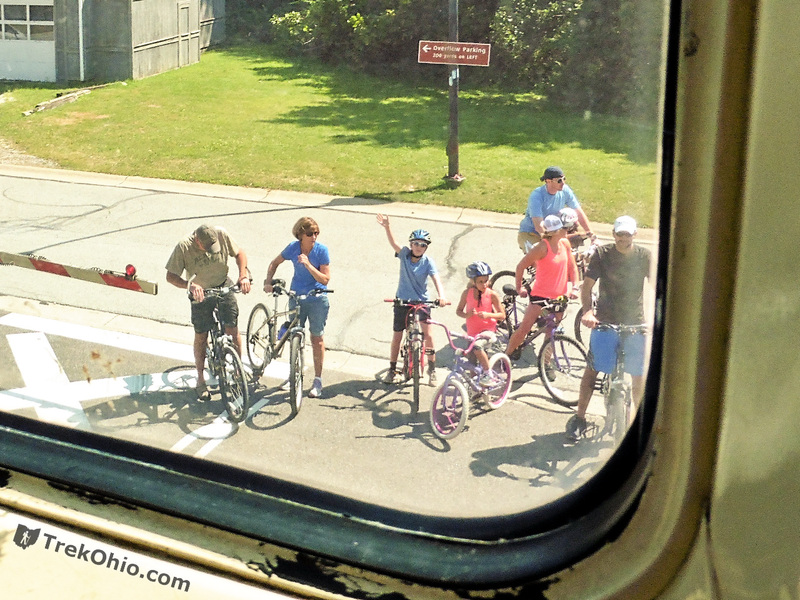 CVSR: Bike Aboard! &dash; spells out the specifics of the program, including a schedule of stops. Don’t forget that hikers, runners, and kayaks can also take advantage of this inexpensive service. 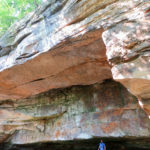 TrekOhio: Summit County Parks & Nature Preserves — This is one of the counties in which Cuyahoga Valley National Park is located; check out this page for links to the official website and for information on nearby parks and preserves. 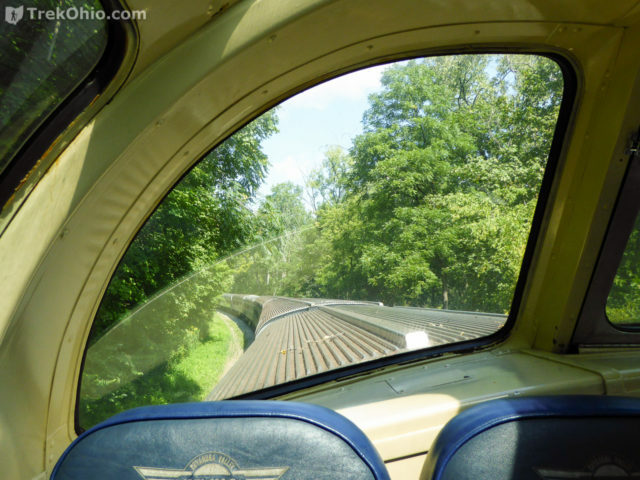 Share the post "Cuyahoga Valley National Park: Scenic Railroad"